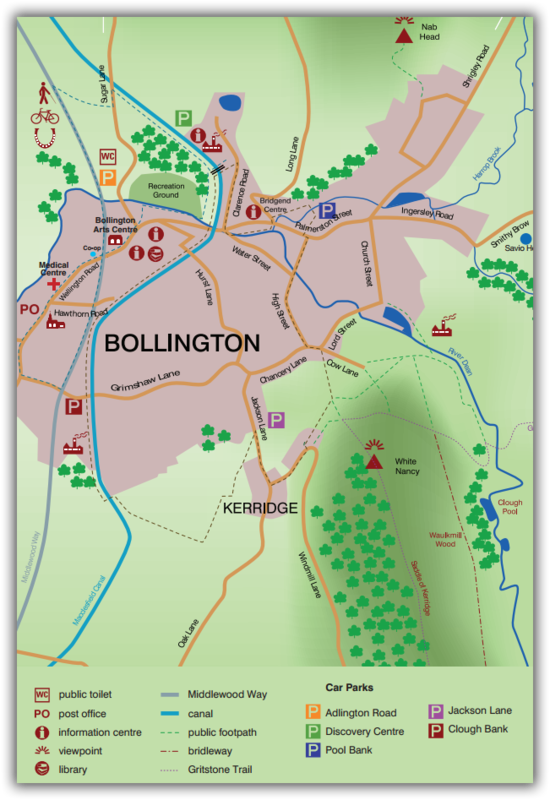 Bollington is easy to get to however you choose to travel. By road The town is located 4 miles north of Macclesfield, just 2 miles from the A523 (Silk Road), so travelling by road is straightforward. By train Services are available at Macclesfield, Prestbury and Adlington, providing direct access to Stockport and Manchester to the north and Stoke, Birmingham and London to the south. By bus Regular Monday–Saturday bus services run between Macclesfield and Bollington, and further services connect to Poynton and Stockport. Further information about bus, rail and coach routes/timetables is available from Cheshire Traveline www.traveline.info or on 0871 200 22 33, 7 days a week, 8am–8pm.